Have you ever encountered a saison that you've dismissed as too "saisony"? If you struggle with this style of beer, you're not alone – it can be tremendously complex, boasting characteristics of its unique peppery yeast strain alongside herbs, spices and other botanicals. But it's precisely for this reason that a saison makes such a dependable beer to grab in a 750ml bottle and enjoy with just about any dish and cuisine. Saisons are farmhouse ales that can be traced back to Wallonia, the French-speaking part of Belgium. Translated from French, saison means ‘season’, referring to the time of year that it was brewed for the farmhands. Before refrigeration, beers were brewed in the cooler months (in this case, usually March) when fermentation temperatures could be kept constant. They were then enjoyed the following summer. The historical table versions of the style were lower in strength; today, stronger examples can be found with ABVs topping 9%. The peppery characteristics of saisons are attributed to its unique strain of top-fermenting yeast, which is thought to be related to a red wine strain. Unlike ale yeast (saccharomyces cerevisiae, which ferments at 13°C) and lager yeast (saccharomyces pastorianus, which ferments at 4-7°C), the saison yeast strain prospers at a fermentation temperature of 32°C. As a consequence of this, the yeast produces a high level of phenols, responsible for its distinguishing pepperiness. Some esters can be present, which are the fruity notes often detected in ales, which usually have some citrus characteristics. Saisons are a highly attenuated style, meaning that the yeast has left very little sugar in the wort; this results in a discernible dryness on the palate. The most famous version of a saison is Saison DuPont from Brasserie Dupont, which has been brewed since 1844 as a farmhouse product, originally sold alongside artisanal foods such as honey. Today, you’ll find it available in any repiutable bottle shop (and for a reasonable price too). If you’re uncertain about the style generally, Saison DuPont is a great starting point. — Garret Oliver, p. 190. When it comes to modern and local iterations of the style, you’ll struggle to find anything more thirst-quenching than East Sussex’s Burning Sky Brewery, whose Saison à la Provision is a refreshing take with additions of lactobacillus and brettonamyces for a crisp, dry and tart take. I’ve always been a fan of Bermondsey’s Brew by Numbers’ saisons as well, which are highly drinkable and can be deliciously adventurous – 01|27 comes to mind, a beetroot and fennel saison. 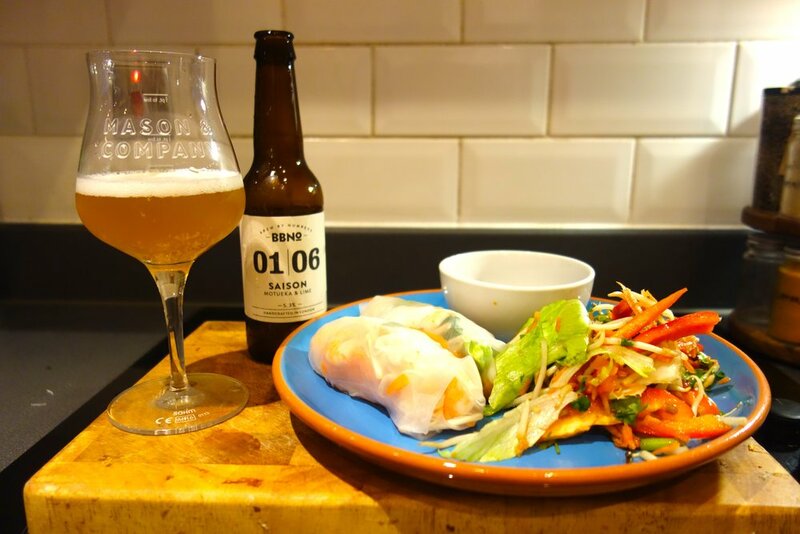 If you feel ambivalent about saison as a style, it’s worth picking up a bottle of Saison DuPont to pair with your next meal, especially if you’re partial to Thai or Vietnamese food. November: the brutal reality check that winter is lurking just around the corner. Clocks fall back, evenings linger. We seek comfort in our pint glasses and huddle together in cosy pubs – the salad days of beer gardens are officially gone – but it’s not so bad. In fact, our tastes seem to be intrinsically linked to the seasons, so it’s an excellent opportunity to recalibrate the palate. Revisiting inky stouts and spicy ales makes this time of year more bearable. This year, Total Ale's Matt Curtis hosted Darker Days, the third annual celebration of darker styles and winter warmers. Held at The Duke’s Head in Highgate, it comprised of a five course beer and food pairing menu meticulously curated with help from Chris Hall from Brew by Numbers and Doreen Joy Barber from The Five Points Brewing Co. The food was dished out by Chalé! Let's Eat, a Ghanaian street food pop-up vendor currently enjoying a residency at Duke’s. Greeted by Matt, groups clustered around several wooden tables in the rear of the pub. The event was advertised in full as ‘Darker Days III: Darker Things’, referring to the popular (and already cult classic status) Netflix series Stranger Things. Some decorative touches alluded to this reference. The Duke's is esteemed for its commendable range on keg and cask – on this evening, the plethora of options included an exclusive keg of Brew by Numbers 08|02 Imperial Stout, Bristol’s Lost & Grounded Brewers' Running with Sceptres and Magic Rock Brewing Co’s Hypnotist, which was launched at Indy Man Beer Con this year. Despite the formidable line-up of beers promised alongside our meal, many attendees happily indulged in another glass on the side. For some, it was the first time they had come across these beers on keg in London. We were introduced to the 'beer dinner' concept of Darker Days by Matt, who had coordinated the pairings based on characteristics imparted by ingredients and textures. Many were unacquainted with the nuances of Ghanaian cuisine, but Matt was confident that his choices would do the food justice and marry with the West African flavours, spices and sauces. He explained that ‘chalé’ means friend in Ghanaian, used colloquially as an equivalent to ‘mate’ in the United Kingdom. This was an apt theme for our gathering, where we were breaking bread – or eating jollof rice - among friends. In the background, a soundtrack of Ghanaian and West African tracks filled the air. We began by grazing on kelewele, deep fried plantains spiced with cloves and ginger, as measures of Five Points Old Greg’s Barley Wine were poured. Doreen introduced the beer and clarified the basis of the pairing: a barley wine, with caramel notes and hints of spices, plays off the natural sugars in the plantain. A slight bitterness from the Challenger, Target and EKG hops creeps in, balancing the sweetness of the dish while marrying well with the cloves and ginger. The vegetarians were then treated to bowls of fried okra with a spicy tomato dip, while meat-eaters were given spicy Supermalt chicken wings with chili sauce. The unique characteristics of each offering called for a different beer; the former was paired with Five Points Hook Island Red to complement the kick of the tomato dip. The rye used in the beer’s malt bill, its mild hop bitterness and bone-dry finish tempered the piquant sauce and harmonised with the okra’s stewed texture. The chicken wings were battered with Supermalt, so it paired naturally with Five Points Brick Field Brown, another malty tipple with chewy toffee notes that mirrored the sticky coating of the sauce slathered on the wings. For the heartiest course, vegetarians were served kontomire, spinach and kale in a coconut base with garden peas and butternut squash. The tender chunks of squash and wilted spinach were richly coated coconut and elevated by Brew by Numbers 01|24 Saison Rye, another beer where rye makes an appearance. Rich, slick and sweet, the beer mingled with the strong coconut flavours and mirrored its milky notes. The meat alternative pairing was beef azi desi, a spicy peanut stew with tender beef steak and okra. It was matched with the decadent, velvety Brew by Numbers 08|02 Imperial Stout. Chris talked us through the profiles of both beers, which were diametrically opposed but equally as delicious. Desert comprised of a chocolate brownie with beer ice cream, accompanied by Five Points Railway Porter. The chocolate notes from the roasted malts and chewy brownie are obvious bedfellows. They melted together in the mouth, amplifying the richness of the brownie, while the ice cream helped cleanse the palate between bites. A relative no-brainer, but a flavour combination that never fails to satisfy. Finally, two cheeses were circulated to be enjoyed alongside Brew by Numbers 14|03 Tripel Ella, a glorious Belgian style ale bursting with intensely juicy Australian hops. The yeast esters meld well with cheese, especially the softer and less pungent varieties, where fruity profiles aren’t overwhelmed and lost. Instead, they mingled triumphantly. The evening drew to a close as the chatter flowed, some people clearly content with lingering until last call. The staff made everyone feel so welcome that it was difficult to leave our dimly lit and snug to face the chill of the November evening. But that’s exactly what we did, moving from Darker Days to a darkened night, already eagerly anticipating next year’s edition. Last Saturday, Old Spitalfields Market hosted droves of music lovers, imbibers and the arrival of sweltering summer temperatures. The latest edition of the London Brewers’ Market, held in conjunction with the Independent Label Market, transformed the East London space into a literal oasis. 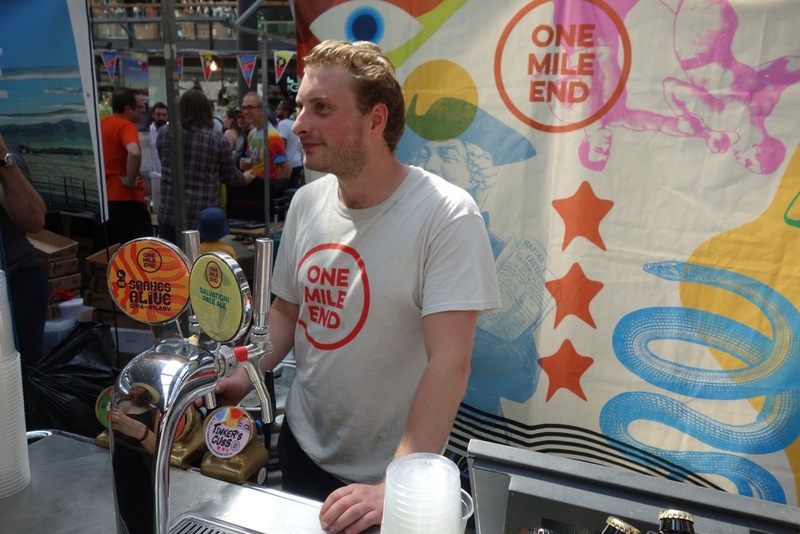 The public were invited to explore the ranges of 27 London breweries under the market’s glass canopy, against the backdrop of a soundtrack provided by a line-up of DJs. Kegs prolifically flowed as the afternoon heated up and stands welcomed steady crowds of inquisitive drinkers. Smaller breweries were manned by head brewers and founders- sometimes both- who animatedly spoke of their ethos, brewing process and future growth. Given the expanding community of independent brewers across the capital, some attendees were afforded their first opportunity to swill a beer from their local brewery. Areas such as Brixton, Croydon and Herne Hill were represented, indicative that breweries are no longer consecrated to Bermondsey and Hackney alone. While pints and half pints still reigned supreme as the measurement of choice, there was a discernible amount of canned beers in circulation. Drinkers loved the convenience of cans, reducing the need to queue and keeping beer chilled in the oppressive heat. Standard 330ml cans were ubiquitous, but there was another resounding success in the form of the 500ml 'tallboy' can: the Juicebox IPA from stalwarts Fourpure Brewing Co. Its generous sizing was paired with a punchy design, catching the eye of neighbouring drinkers. In addition to this, a further development in canning was offered from The London Beer Factory, the first brewery in the United Kingdom to use 360° can designs, which allows the top of the vessel to peel away to reveal a cup shape. More than a single afternoon would be required to sample everything that caught my eye, but some of the beers were consistently on the lips of bloggers, writers and friends. Following the advice of my erudite colleagues, I was fortunate enough to try some standout examples and I’ve compiled my picks of July’s LBM below. Juicebox citrus IPA from Fourpure Brewing Co: I’ve already extolled the aesthetic virtues of the packaging, but the contents inside of the can merit just as much crowing. This is a tsunami of citrus aromas and flavours and was, in my opinion, the superior thirst-quencher of the day. Orange zest and mango on the nose are balanced with crisp bitterness from the hops, making this a seminal summer beer. Snake's Alive DIPA from One Mile End Brewery: The LBM was abuzz over the relaunched Snake’s Alive DIPA and it lived up to the hype. It’s a smooth, harmonious DIPA with a sneaky ABV of 8%. A soft, sweet nose with hints of tropical fruits ranging from peach to mango, the malts are smooth and sweet, but all is tempered by a glorious dry finish. Proving popular on the day, this is perhaps the brewery’s most exciting beer yet. Milou saison from Bullfinch Brewery: A fantastic Belgian pale ale that was brewed for a sun-drenched afternoon. Nice fruity notes from the yeast, the creamy mouthfeel that you’d expect from a wheat beer and subtle bitterness from the noble hops combine to deliver a mellow and refreshing drink. This is a fine example of the great range available from this Herne Hill favourite. VIPA from Oddly: Marking their inaugural visit to LBM, Oddly’s IPAs were catching the attention of drinkers- in particular, the unusual offering of this IPA infused with masala chai, which resulted in a highly drinkable beer. It was extremely aromatic with a marriage of spicy earthiness from the chai with Citra hops for an enormously palatable and modern take on the IPA. 05|18 India Pale Ale: Galaxy & Nelson from Brew by Numbers: It’s not unexpected that the masters of consistent and adventurous beers were decanting another knock-out. This time, it was in the guise of an IPA hopped with Galaxy and Nelson hops. Perfectly matched with the sunshine, the antipodean hops brought a chorus of tropical notes rounded off with a nice, clean bitter finish. This one really danced on the palate with lots of crisp, bright flavours and aromas. While the summer weather undeniably favoured temptingly refreshing IPAs, the above examples really stood out as exceptional. Alongside the rising popularity of cans, a quick recce of the LBM crowd confirmed that the IPA is alive and well- a rainbow of Juicebox tins and hazy golden pints certified this. Whether or not this is a barometer to gauge current trends in the beer industry is difficult to tell, but there's one thing for certain: this is how customers, both committed fans of beer and those who merely found themselves there on the day, were drinking. And that's the joy of LBM, a free event open to the public- it's about the beer and the breweries, no gimmicks- there's no purer form of democracy than voting with a pint glass. The London Brewers' Market is organised and managed by The Five Points Brewing Company. Be sure to keep an eye on their website for upcoming events.